The Brazilian division of General Mills is expanding its Yoki line of microwaveable popcorn in Brazil with a new line that includes the unusual flavours of hamburger and pizza, according to a report in Giro News. The new line features images from the Warner Bros’ film Justice League used under licence, and comes in a traditional Butter flavour in addition to Hamburger and Pizza. Launched in time for Dia Das Criancas (Children’s Day) in Brazil (12th October), Yoki Justice League Microwave Popcorn comes in a 50g pack, each featuring a different character from the film: Batman is featured on the Hamburger variety, Superman on the Pizza flavour and Wonder Woman on the Butter flavour. 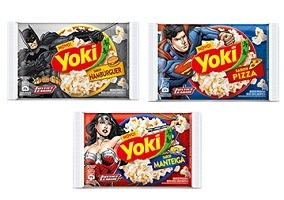 The new Justice League launch adds to a Yoki popcorn portfolio that consists of Plain, Plain with Salt and Butter varieties, as well as coated popcorn in the variants Butter, Caramel and Chocolate.